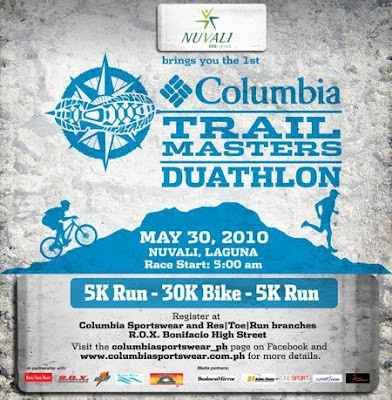 The Columbia Trail Masters Duathlon was created to induct outdoor enthusiasts to an active outdoor lifestyle. This year marks the inaugural edition of Columbia. Filipinos are encouraged to embrace an active, outdoor lifestyle. This is why the Columbia Trail Masters was created. It is a series of off-road duathlons that will be held in various provinces throughout the Philippines. These run-bike-run events will be conducted entirely on trails and dirt tracks and shall be open to both elite and amateur athletes alike. The first leg will be held on May 30, 2010 at Nuvali in Sta. Rosa, Laguna. *Plus 20k worth of prizes to be given away. All participants will get a muscle shirt, 1 car sticker and 1 Gatorade upon registration and after the race. Deadline of Registration: May 21, 2010. No online registration for this event.